Chip Drozenski passion has always been fly fishing and fly design. Unfortunately, this passion was interrupted by thirty years of life in Corporate America. Chip Drozenski, has fished many of the great rivers in Argentina but one of his favorites is the Limay River better know as the River of Monsters. Join us to discover the secrets of this river where the average migratory browns and rainbows are 26 to 30 inches and trophies are 36 to 40 inches. These monsters can weigh 10 to 20 pounds and be caught in water less than 3 feet deep. This is one show you don't want to miss! 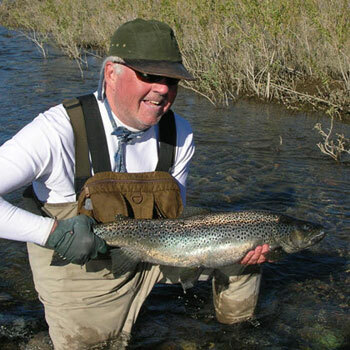 Chip has been fortunate enough to fish many of the great trout and salmon rivers worldwide. His home water is the Delaware River, which he's been fishing since 1968. There he finds happiness with selective trout that prefer midges and tricos. In 2003 he retired and shortly thereafter discovered Argentina. He spends every chance he gets fishing all the waters Patagonia has to offer. What Chip enjoys about Patagonia is that it has a little bit of everything including big rivers, small rivers, spring creeks and stillwaters. There are many choices, the crowds are few and there are some huge fish to be caught. In addition to all the exciting fishing options this destination has to offer he has found some unique fisheries that look like bonefish flats but with big cruising bows and the "River of Monsters' where fish over 10 pounds are plentiful and a 20 pound fish is a definite possibility. Chip works as part of Andes Drifters and is truly living the dream! One of Chip's friends as dubbed him the 'old gray trout bum', which name he relishes as well as the perks that his new life in the reel world has to offer.